TxState’s Aurora String Quartet, consisting of graduate students Ryan Coppin and Shijun Chen (violins), Xavier Garcia (viola), and Belinsol Martinez-Muñoz (‘cello), and the Andrea String Quartet, consisting of undergrads Joseph Waukechon and Kailey Johnson (violins), James Ximenez (viola), and George McQuade (‘cello), performed recently at Klein High School and Tomball Memorial High School. Their final concert combined both quartets for an outstanding performance of the Mendelssohn Octet. String faculty Dr. Lynn F. Ledbetter, Dr. Ames Asbell, and Dr. Karla Hamelin gave master classes on All-State and All-Region high school and middle school audition material for over 150 students, and performed a Beethoven Serenade. Dr. Rebecca Tast also met with students to explain and promote the career option to become a music educator. This entry was posted in alumni students faculty NEWS on October 29, 2015 by Thomas S. Clark. Dr. Martin McCain was recently invited to perform a week of concerts as principal bass trombone with the Malaysian Philharmonic Orchestra in Kuala Lumpur, Malaysia. While in Asia, McCain also gave a masterclass and taught lessons for students at the Yong Siew Toh Conservatory of Music. He also performed with the Charleston Symphony Orchestra and presented a masterclass for University of South Carolina trombone students. This entry was posted in alumni students faculty NEWS on October 27, 2015 by Thomas S. Clark. Dr. Joey M. Martin served as guest lecturer and conductor for the Kuesta Collegiate Choral Festival of South Africa in September. 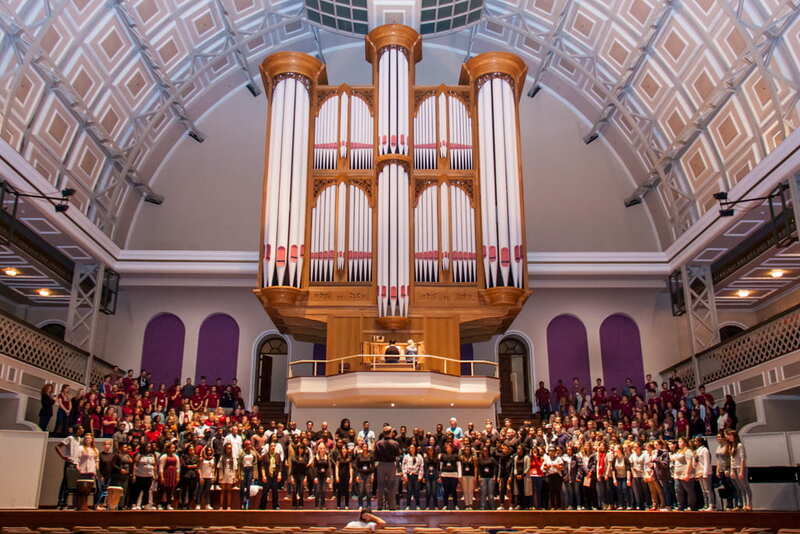 Choirs from Stellenbosch University, the University of Pretoria, the University of Johannesburg, and the Nelson Mandela Metropolitan University participated in the festival. This entry was posted in alumni students faculty NEWS on October 26, 2015 by Thomas S. Clark. This entry was posted in alumni students faculty NEWS on October 23, 2015 by Thomas S. Clark. In a faculty chamber music concert given at the Performing Arts Center October 21, Faith DeBow performed Bach on our beautiful historic replica Flemish harpsichord . . . using an iPad to read her music! Other performers included flutist Adah Toland Jones, violinist Paula Bird, and cellist Karla Hamelin. This entry was posted in alumni students faculty NEWS on October 22, 2015 by Thomas S. Clark. Andrew McNair, a senior in the Bachelor of Music in Music Studies program, has been named an Academic Achievement Scholar. In addition to his involvement in the School of Music, Andrew is also involved with the Honors College and just returned from Luzerne Music Center in New York, where he worked over the summer as a voice counselor. This entry was posted in alumni students faculty NEWS on October 15, 2015 by Thomas S. Clark. Dr. Mary Ellen Cavitt was awarded the Everette Swinney Faculty Senate Award for Teaching Excellence this August at the Fall Convocation. In September she traveled to Japan to present research at the International Symposium on Performance Science in Kyoto. She extended her visit to observe and collect data in instrumental music classes in middle and high schools in Hiroshima and Okayama. The first concert of the year by our Texas State Symphony Orchestra Oct. 9 in Evans Auditorium attracted an audience of 438. Along with other exciting works, they heard a superb performance of the Shostakovich 9th Symphony under the baton of their new director, Maestro Carolyn Watson. This entry was posted in alumni students faculty NEWS on October 10, 2015 by Thomas S. Clark. Martin McCain recently traveled to Joao Pessoa, Brazil as a guest artist for the XXI Festival Brasilerio de Trombonistas. 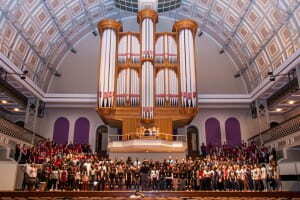 He presented several masterclasses and coached trombone choirs in addition to giving a featured recital. He also established new collaborative efforts between the Brazilian Trombone Association and International Trombone Association. This entry was posted in alumni students faculty NEWS on October 6, 2015 by Thomas S. Clark. Daris Hale, Senior Lecturer in Music, has just been named as the new Fulbright representative for Texas State’s Fulbright Scholar Program. Hale is a Fulbright Ambassador who shares her experiences nationwide through events sponsored by TEDx (Technology, Entertainment, Design) under the auspices of the Fulbright Association.